This very special legacy journal will fill you with smiles as you ponder where to begin; your first kiss, that worst job, your own mother's favourite catchphrase, or when you first began to think about having your own children. This enchanting volume captures all of those memories and tells the story of who you were, where you came from, how you grew and the main events that shaped you into who you are today. This is a book for sharing - now and as a loving legacy. Imagine, sitting with your own daughter while, together, you both write, laugh and reminisce. The journal cover is constructed of quality man-made material imported from Italy, with the look and feel of glove leather (trade name LuxLeather). The exquisite cover artwork includes skillful embossing and silk screen print. More design features include silver gilt-edged pages and an attached ribbon page marker. Sections: Me: At a Glance, A Few of My Favourite Things, My Life as a Little Girl, My Family Life, My Education, Me: On the Job, My Love Story, My Life as a Parent, A Life Worth Celebrating, My Life: The Main Events, My Sources of Inspiration. 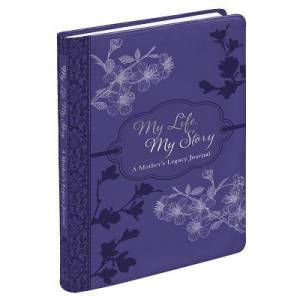 Journal My Life, My Story - A Mother's Legacy Journal was published by Christian Art Gifts in January 2001 and is our 25140th best seller. The ISBN for Journal My Life, My Story - A Mother's Legacy Journal is 9781432109349. Be the first to review Journal My Life, My Story - A Mother's Legacy Journal! Got a question? No problem! Just click here to ask us about Journal My Life, My Story - A Mother's Legacy Journal.